Chalcedony with plenty of admixtures as the thin dissipated dye-stuff (including oxides of ferrous iron and aluminium) name jasper. Siliceous mountain rock of sedimentary or volcanic origin. It consists of microscopic quartz grains, hardpan chalcedony with large admixtures, and quartz. It adamantine inorganic carpentry mineral, which can be entangled with more soft painted varieties of marble (organogenic). 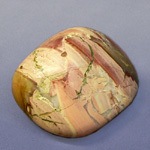 Colouring of jasper can be red, синей, green, violet, white and even black. There are jaspers one-colour, but more frequent than all they are spotted or with varicoloured bars (pied, band, striped, speckled etc.). On the salutary affecting proprietor Jasper stands in one row with a cornelian and mountain crystal. Among the numerous varieties of quartz educations am one, absorbing all of spectrum of sunlight, - yellow-red, red, orange, yellow, green, blue, brown, violet, almost black and white. Such complete palette of paints is known by not a single stone in the world. 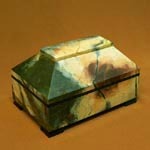 In ancient literature the concept of Jasper had collective character. 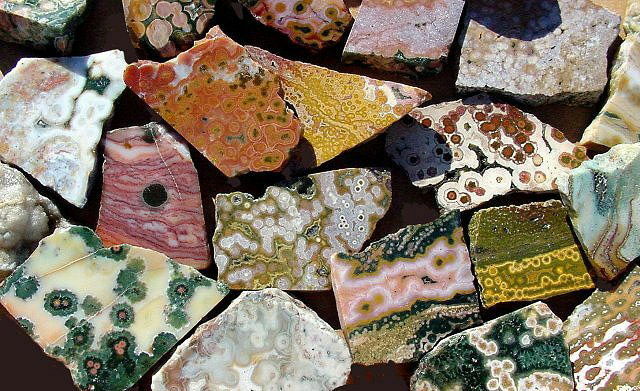 All of hard, motley colores stone were named jaspers, including nephrite, volcanic rocks are porphyries, Rogitinums, flints and other In XIX century began to name jasper only siliceous hard, well polishable mountain rocks. 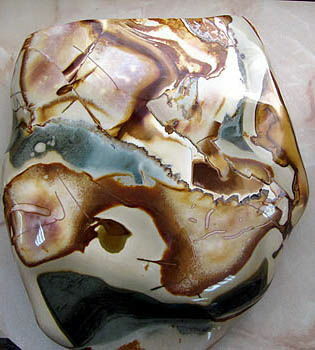 Jasper is a mountain rock, containing the fars of quartz which can be included in jasper in any display. An origin actually of jaspers is related to volcanic activity, but the process of formation of this rock takes a place locally. 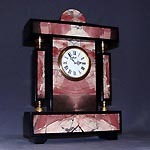 At forming of jasper influence of high temperatures and enormous pressures is obligatory. All of it predetermined the enormous number of varieties of jaspers. Jaspers more frequent than all meet as continuous the masses, rarer as buds and balls. 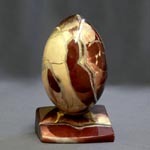 High hardness Mohs of this stone, and also ability to break away and create very thin and sharp cuttings edges a long ago, were noticed a people which used jasper for domestic and economic needs. 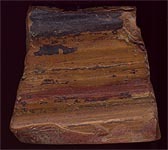 Originally jaspers and flints obtained earths from a surface. However already 3-4 thousands of years ago begin booty of stone under earth. 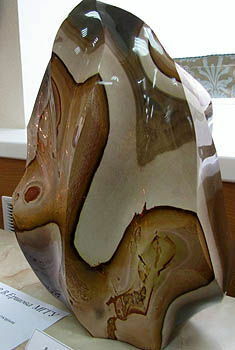 The deposits of jasper meet everywhere, however got a most fame was by jaspers of Ural and Altai. On Ural a jasper belt stretches from a north to the south. The known deposits are located near Orsk. 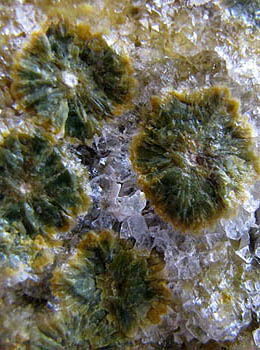 A Orsk mine deposit is beds of motley of landscape and band jaspers on diabases. Pestrocvetnye of jasper have a form of lenticular bodies power 0,2-3 m long a to 40 m, on a mountain Colonel - wrong, core streak bodies. Mineral composition of орских jaspers: grains of quartz by the size of 2-10 mcm, rarer to 40 mcm, grains of Garnet measuring to 3 mcm, anhydroferrite in the pulverulent state, magnetite as octahedrons measuring to 20 mcm (in the bars of beet color). In a 1,5 km to the west of mountain Colonel the Western deposit is located. Jaspers are rose to the red color with areas, look like the drops of blood. Composition of jaspers a few other: Quartz, Garnet (to 20%), anhydroferrite (to 2%), Pyrite, actinolite, chlorite. In a 34 km south of mountain Colonel is Anastasevskoe mine deposit of jaspers, being the system of shallow lenses long a to 20 m and by power to 4 m. Jaspers of red color with a heterogeneous, not uniform structure. In composition these jaspers the amount of anhydroferrite is megascopic to 5%. Jaspers of Kalinovskogo mine deposit, located in a 30 km north of mountain Colonel are very beautiful. Band jaspers at which crimson layers alternate with green bed here. In the complement of jaspers enter: Garnet - to 13%, anhydroferrite - to 1%, Pyrite - to 1%, Quartz - to 8,5%. The deposits of Jasper rocks are present also in Crimea (Karadagskoe), East Siberia (on there is Lower Tunguska), Armenia and in a number of other districts of the CIS. 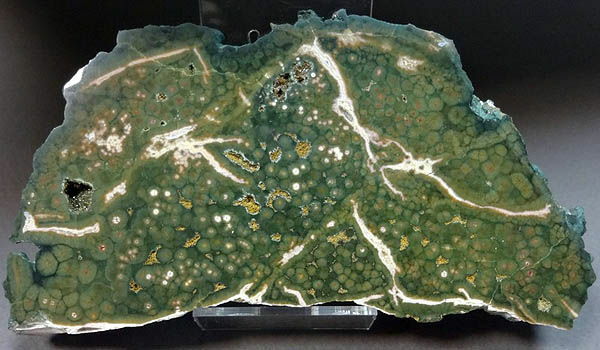 Abroad the large deposits of jasper are known in the USA (states of Californium, Oregon and other), Japan, Czechoslovakia, Germany, India, Venezuela. 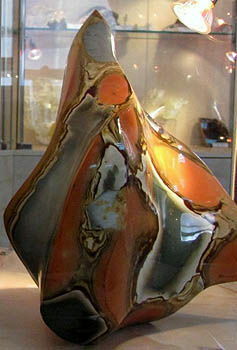 Presently Jasper plays a considerable role and in a technique. However mainly Jasper is used for making of jeweller decorations, sculptures and in architecture for finishing of apartments. Cornelian, Sard, a crystal and Jasper befit absolutely to all of people. Jasper is a talisman of quiet and happy successful house, where an order and harmony will reign in all of spheres of life, because it protects a proprietor from negative influences and purges space from all "strangers". It is a stone-amulet, charm and talisman of alchemists, science people, travelers, researchers, in general all, who aspires to knowledges in any forms and displays. Stone frightens off aggressive wild animals. 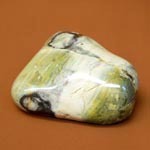 Jasper is a talisman of beauty, grace and riches. 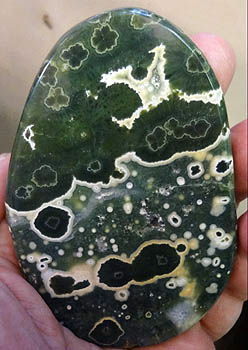 Cold tones of jasper reflect especially swiftly attack of all of wicked creatures and essences, and a courage and firmness is given a proprietor. Jasper is a wonderful and unselfish grantor of energy. The prolate forms of wares (oval, drop, triangle by a top upwards) promote as though to the power shower of proprietor, and spherical forms - create terms for the accumulation of energy in an organism, that especially usefully to the people, by possessing explosive temperament and feel like flashes. Stone also is a wonderful defender those, who is dear a proprietor, especially, if him unnoticed to underlay in their pocket, bag et cetera by Jasper in antiquity often laid out floors in temples, especially in secret apartments, where a stranger must not was penetrate: it perfectly protects from superfluously curious. 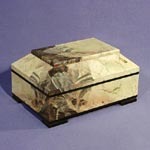 Jasper tableware, small boxes, boxes, bowls, vases are good amulet, charm, talisman not only at home but also those objects which it is necessary to save and keep. Vases and similar to the vases, especially prolate and large, wares quickly take off a fatigue and promote tone, if to them to touch and be in such apartment. 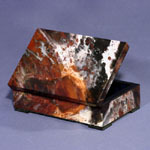 Stone is able to influence even in the distance, if, for example, to insert a portrait in a jasper frame. However, this quality distinguishes a cornelian, and all of Chalcedonys. This unusual rock was found in the native bedding along the north-western coast of Madagascar after a few years of unsuccessful searches. A deposit is a риолитовый stream which was fully silicide. 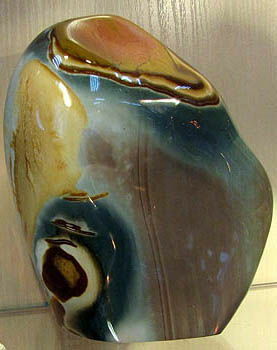 Ocean Jasper is obtained only in one mine near Maruvatu (Marovato). Deposit, as it is located on verge of ocean, it is possible to look after and develop only at an ebb. There are not roads in this remote part of island, the therefore obtained material (Madagascan Agates and jaspers) is taken out on boats. They have a bright picture from concentric circles. 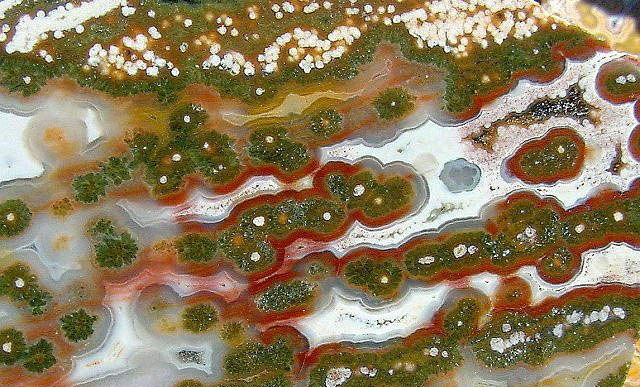 Jasper of Madagascar, skarn of Dal'negorska and other carpentry stone. Photo: © A.A. Evseev. Jasper. Zavalevskiy mine, Pobuzhe, Ukraine. Photo: © A.A. Evseev.